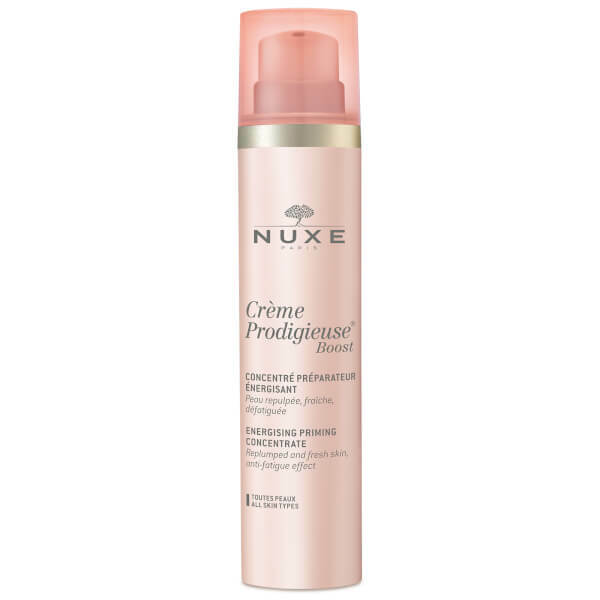 Prep your skin day and night with NUXE Creme Prodigieuse Boost-Energising Priming Concentrate, a silky serum-lotion inspired by Korean liquid cosmetics. Melting in effortlessly, the primer utilises two types of Hyaluronic Acid to deliver hydration deep below the skin surface, helping to smooth out fine lines whilst toning the facial contours. Vitamin C provides a visible brightening effect for a youthful and radiant finish. Aplicar por la mañana o por la noche en forma de puntos en el rostro, el cuello y la zona del escote, debajo de la crema facial habitual. Aqua/Water, Glycerin, Alcohol Denat., Ppg-26-Buteth-26, Phenoxyethanol, Ribose, Peg-40 Hydrogenated Castor Oil, Ethylhexylglycerin, Xanthan Gum, Chondrus Crispus/Carrageenan, Ascorbyl Glucoside, Sodium Gluconate, Gellan Gum, Parfum/Fragrance, Butylene Glycol, Hydrolyzed Hyaluronic Acid, Sodium Hyaluronate, Pentylene Glycol, Citric Acid, Jasminum Officinale (Jasmine) Flower Extract, Arginine, Sodium Hydroxide, Mica, Ci 77491/Iron Oxides, Calendula Officinalis Flower Extract, Faex Extract/Yeast Extract, Tocopherol, Benzyl Salicylate, Linalool, Citronellol, Alpha-Isomethyl Ionone [N3905/A].